Do you regularly eat fermented foods? Have you heard that they’re good for you (and your gut!) but wonder where to start? Us too! We asked nutritionist and personal trainer Dustin Millhollen to shed some insight and answer our questions about how and why to get started with fermented foods. Q: How do probiotics and fermented foods work to create a healthier gut? Probiotics and fermented foods introduce beneficial bacteria to our digestive systems that aid in the breakdown of food, synthesis of vitamins and nutrients, and removal of waste products. The digestive system is full of bacteria and the objective is to have the proper diversity, quantity, and balance of them so as to provide the most health benefit. Probiotic supplements and fermented foods aid in this. I prefer fermented foods because they offer more diversity. 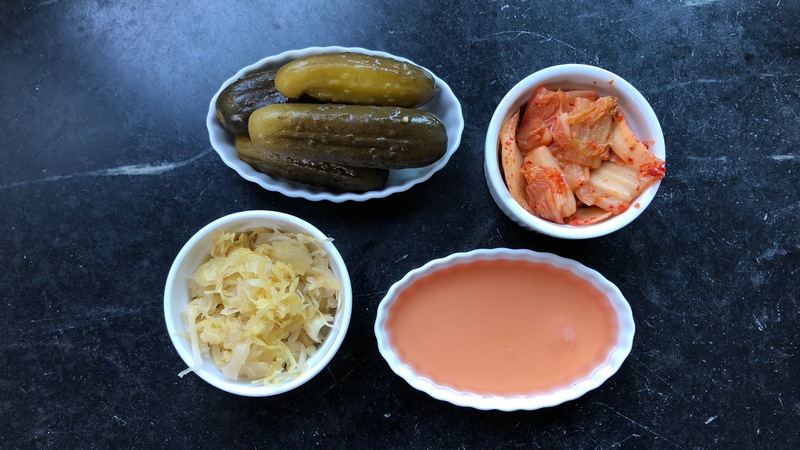 A typical probiotic supplement contains between 2 and 14 different types of probiotic bacteria, whereas a naturally fermented food like sauerkraut or kimchi can have hundreds of types of bacteria. Q: What are you personal favorite bang-for-the-buck fermented food choices? I really like sauerkraut from Oregon Brineworks, pickles from Moonbrine, kimchi from Choi’s (all 3 local), kombucha from GT’s, and pickle relish from Bubbies. Q: If you’re new to fermented foods, what’s the best place to start? The most typical fermented food is yogurt. Most people have had it and think it’s tasty. I like yogurt, but the bacterial diversity of yogurt is limited because there are generally only 3 to 5 types of bacteria in it. If you’re into trying something new, I would go for sauerkraut. It’s a bit tart and delicious on hot dogs. Yes. Salt is used in traditional fermentation processes (i.e. pickles, sauerkraut, kimchi) for flavor, but it allows the bacteria to culture and grow. Vinegar brines on the other hand don’t allow bacteria to grow because of it’s acidic nature and therefore isn’t a true fermented food. Q: How much fermented food should someone aim to eat? This varies from person to person and can be anywhere from a tablespoon to a cup per day. If you’re just getting started with probiotic foods, start out slowly. Too much, too soon can cause some digestive upset. Try a little bit of sauerkraut or kombucha and see how you feel. Up your consumption a bit more every few days and find out where you feel optimal. Q: Is there any concern about salt consumption? Salt consumption is a concern for some people, but fermented foods typically don’t contain a lot of salt and they’re eaten in such small quantities that it usually isn’t an issue. If you’re very sensitive to salt, then stick with kombucha or yogurt for your fermented foods. Expert Dustin Millhollen is a personal trainer and nutritionist at Hyatt Training. He holds an MS in Nutrition from National University of Natural Medicine and a CSCS from the National Strength and Conditioning Association. Learn more about Dustin, or get in touch with him by emailing us at Go@HyattTraining.com. At Hyatt Training, your optimal health and wellness is our #1 goal. We blend art and science to create programs that are applicable to life and sport. We bring together strength and conditioning, cardiovascular health, yoga and nutrition to deliver a comprehensive lifetime health and wellness strategy made just for you. If you liked this article, you may also like some of our other posts about nutrition or holistic health.